Put an end to fat finger mistakes on your device with this blue ink ballpoint stylus pen and help support The Lion and Tusk Museum. All our stickers are made from high quality vinyl and printed with long lasting ink these stickers are guaranteed not to fade or deteriorate from UV under normal use for 5 years. Pictured below from low resolution scans - the real thing is nice and clear. All above priced at $2.50 each plus postage. 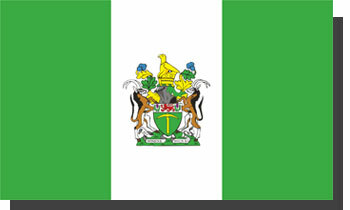 Rhodesian Flag constructed with high quality, Ultra-Knit 100% Polyester. Number plate surrounds. 4 to choose from - note the surround #3 comes as pictured or with the Zimbabwe Independence ribbon on the left and the RGSM ribbon on the right. They will fit NZ standard plates (120mm x 360mm) if you are ordering from overseas they may not fit - please check you plates before ordering. "I had to cut the plate down and remove the two bottom plastic clips on the surround. I then drilled a 1/8th hole in each bottom corner where I fitted a stainless steel screw and nut, painted the heads black to match." Price $12 each plus postage. Made in Italy and custom engraved in New Zealand. 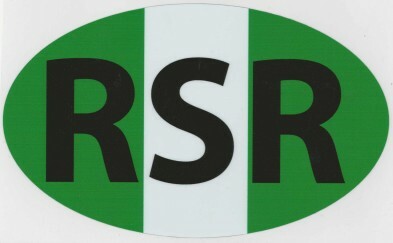 Badges shown below are available. We can produce other badges if required. 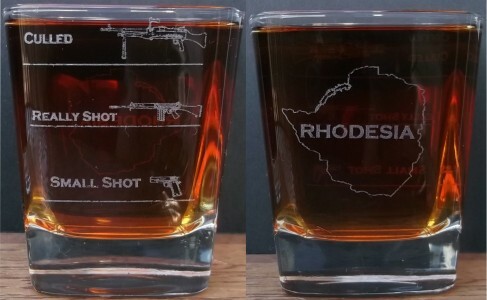 We will accept orders for any number of glasses. 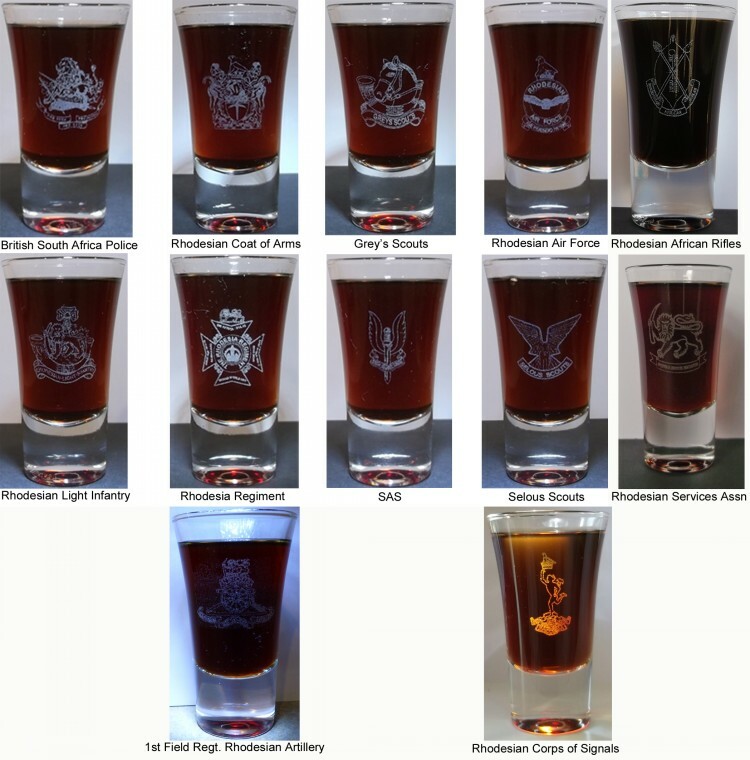 On account of the engraving we recommend that these are hand washed. 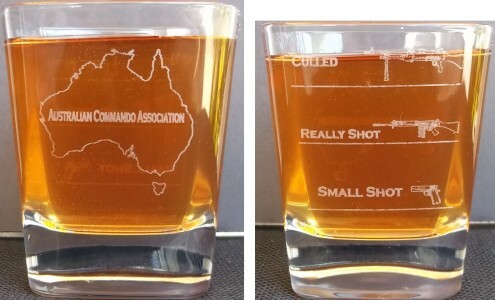 Showing both sides of this square profile 'Borgonovo' brand (made in Italy) whiskey tumbler with unique engravings - chose either Rhodesian and Australian Commando Association. Very hard to photograph because it is very shiny. Made from stainless steel. Slimline, durable, light weight, would make a great present. Painted key rings donated by the late George Morgan. Hand painted and clear coated with hard varnish. 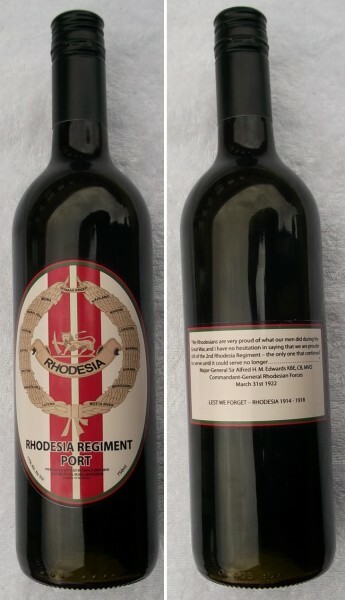 As shown below all have the Green & White on one side and regimental colours on the other side. Fasteners may vary from image below. 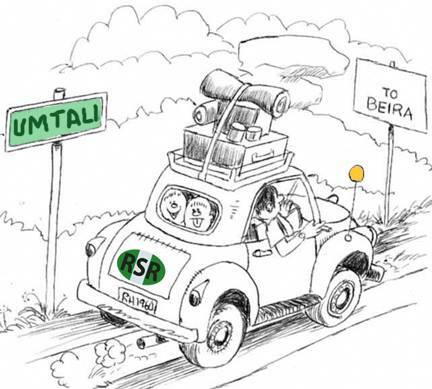 Centre row: Armoured Cars; BSAP; Engineers; Guard Force; Grey's Scouts*; Intaf; Medics; Military Police. Bottom row: Pay Corps*; Rhodesian African Rifles*; Rhodesian Light Infantry; Rhodesia Regiment*; SAS; Service Corps; Selous Scouts*; Signals. Badges on Mugs in the UK will make and supply mugs (see example above) with a badge on each side and with the option (for free) to have a name or words of your choice added on. Key rings are also available to order. You can expect excellent service from Badges on Mugs. Having personally dealt with them I can say that their service is excellent. 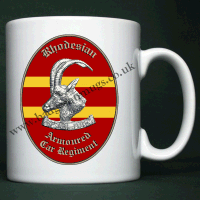 Use this link www.badgesonmugs.co.uk then the Rhodesia tab on the left hand side. 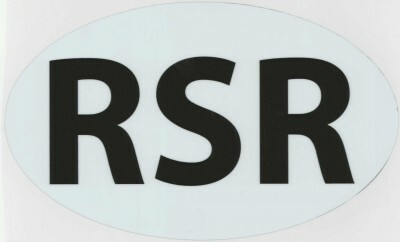 When ordering please insert RSA in the Voucher Box which is directly above the box that asks for your email address. This means that Badges on Mugs will make a donation to us of £1.50 for every mug sold this way. Please support them by purchasing a quality item and in turn they support us. PLEASE - Don't forget insert RSA in the voucher box which is just above where you insert your email address when ordering. 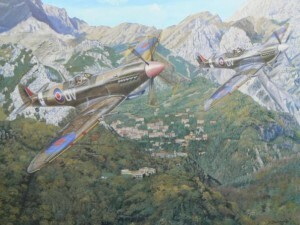 There are 200 Gallery Quality Prints left which are individually numbered and signed by Ian Smith and the artist. Price at R1980 (US$290 or £180). 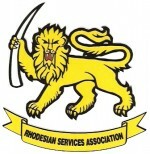 A R500 per sale will paid to the Rhodesian Services Association from generated sales.